You are currently browsing the tag archive for the ‘Global Financial Crisis’ tag. And so the blog, like its name, is a mongrel. Its genes come from a long lineage of campaigning reporting and old Fleet Street hackery. But it also contains the DNA of an entirely new breed of “citizen journalism” – researching, publishing and marketing from the kitchen table. The question remained: could a blogger with no investigations budget, no marketing spend and – at the beginning – precious few readers ever have any influence? Can journalism take place without a newspaper? Yesterday I was privileged to have the opportunity to interview John Pilger, currently promoting his documentary The War You Don’t See. The film itself is fascinating, featuring previously untelevised footage of armed conflict (and the aftermath) in Iraq, Afghanistan and Palestine. Above all it presents an impassioned argument defending the integrity and necessity for investigative journalism. Disillusionment with corporate takeovers of media outlets and political analysis that is openly partisan have led us to the era of Wikileaks, where raw data has replaced the function of the journalist, or the broadcaster who can be trusted to relay the news to the public. It is therefore serendipitous that I should pick Brendan Montague’s book to read today, with all these thoughts about freedom of the press and the proliferation of political propaganda in recent years bouncing around in my head. Montague was a former Fleet Street journalist who started his own blog in lieu of approaching sundry defanged newspapers with his hat out looking for a job. Unlike many other bloggers he had the training and discipline from working a newsroom desk and doorstepping sources. Another distinguishing feature of his blog, The Sauce, was that it came from a leftist perspective, freed from the politically right drift of the mainstream press (or the likes of Guido Fawkes in the blogosphere). Ultimately what Montague is describing in this collection of pieces previously featured on The Sauce is quite similar to Pilger’s argument in his latest film – the complete collapse of journalistic objectivity. However, The Sauce embraces the opportunities offered by this abandonment of unbiased reporting in the press, by releasing critical articles that are not above suggesting how Friedrich Engels could apply to global warming for example. Montague found a curious freedom online that was denied to him by the compromised paper and ink brigade. Many of the items featured here identify stories that were either ignored for being considered too sensitive, or were not treated of enough. The Global Financial Crisis, rather than ushering in an opportunity to review from first principles the circumstances that had led to disaster, instead was used as a smokescreen to justify massive cut-backs and lay-offs of staff, all the while continuing with the same methods of profiteering that led to the crisis in the first place. Then there was the disturbing resurgence of support in Britain for the BNP. Montague contrasts the macho posturing of the party and its leader when delivering racist screeds against immigrants and naturalised Britons, with his reaction to an organised protest of his policies witnessed by the blogger: Nick Griffin, who has denied the Holocaust and wants a white-only Britain, was ashen faced. There was terror in his eyes. He quaked like a child. He describes how the death of Ian Tomlinson, who happened to be walking past a protest rally, would have been spun with the full co-operation of the mainstream media as the result of ‘mob violence’, where it not for the intervention of a witness on the scene who just happened to film the event and released it. Another piece reveals how former MP Tony Benn was himself questioned for possessing a camera, under new anti-terrorist legislation. The threat of citizen journalism has made all civilians possible targets for questioning. One major story that happened to involve Montague personally was the News of the World phone-hacking scandal. Currently still on-going, with many who are suspected to have been involved still in the clear for now, Montague’s own story was hacked while he was in the process of negotiating the sale of a story. He concludes that the phone hacking is a consequence of the lowered standards of journalism, as a result of staff-cuts and the neglect of sources. In lieu of working to prove a story, newspapers would rather violate privacy in order to secure a front-page. A Year on the Sauce presents a politically astute and informed perspective on the threats facing legitimate journalism today. A refreshing and inspired critique. Suddenly I realized something: in spirit, I was very much like my father. By inclination I was not a true perma-bear, but I was nonetheless a bear. Or perhaps I was a vulture; that’s a slightly different breed, but much the same, one of God’s creatures that can smell death when it’s in the air. One truism that drives me up the wall, is the oft-repeated claim that no one saw the GFC coming. No one knew that it was a bubble. No one could foresee that unregulated banking and trading of bonds could go wrong. What absolute bunkum. My favourite story is Queen Elizabeth’s visit to the London School of Economics in November 2008, when she demanded to know how the crash could have happened? A panel of economists responded with a letter that admitted many had seen the crisis on the horizon, but they had been ignored. 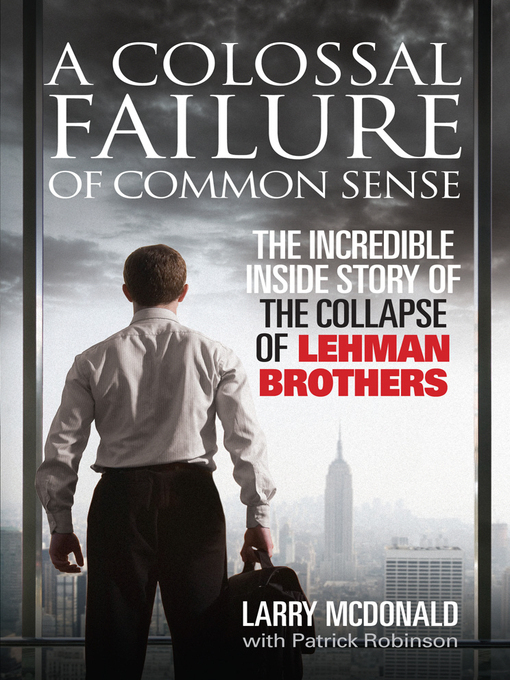 A Colossal Failure of Common Sense: The Inside Story of the Collapse of Lehman Brothers by the company‘s vice president Lawrence G. McDonald and Patrick Robinson offers an inside perspective of the events that led to this global firm’s Chapter 11 filing. Lehman’s is another phantom of the GFC, whose collapse much like that of Enron and Worldcom, represented very visible signs of the tenuousness of the market. McDonald discusses his own life before Lehman’s at length. A product of a broken home, his dad was himself a successful businessman who chose golf over his wife and five children. McDonald credits his own success to an aptitude for hard graft, determination and having not been inculcated by the Ivy League business school mentality. At one point he favorably quotes similar sentiments from Michael Douglas’ character in Wall Street. The book also discusses the dotcom bubble which preceded the turn of the century. McDonald was one of the founders of ConvertBond.com, which purported to represent the future of business trading – entirely online, with a far more accurate, up to the minute assessments of bonds. He claims his partner Steve Seefeld had a greater understanding of computer programming than anyone in the United States, with the exception of Bill Gates. The two were young turks on the business scene, intimidating the established business experts with their new-fangled approach to trading and aided in their promotional blitz by the recruiting of reporter Kate Bohner. McDonald eventually made his way to Lehman’s after ConvertBond.com was bought out by Morgan Stanley. He takes the opportunity to discuss the Enron scandal briefly, before discussing the regime at his new firm, identifying CEO Richard S. Fuld as an ivory tower figure, supported by a patsy Chief Operating Officer Joseph M. Gregory. Their blinkered perspective, as well as the signing of a repeal of Glass-Steagall by President Clinton, combined to end the reign of Lehman’s on Wall Street. The subtitle The Inside Story of the Collapse of Lehman Brothers should be understood as a very literal description of the book. Readers expecting an objective assessment of the economic crash should look elsewhere. This topic needs a Rajiv Chandrasekaran to give a proper account of what happened. Instead of addressing the realities of the GFC for ordinary people, McDonald indulges in long-form autobiography. The brief asides on the extent of the crash feel insincere. There is also an overreliance on military metaphors, perhaps a holdover from co-writer Patrick Robinson’s naval fiction. What emerges from this account is an unintended vision of a Wall Street enclave of self-mythologizing traders, which explains how the scope of greed revealed became so staggering. It occured to me that what precipitated the Global Financial Crisis should not be referred to as ‘white-collar crime’, despite the embezzling, fraud and theft. ‘Crime’, presumes the possibility of being caught. This is a dull, long-winded and disappointing reflection on one of the most devastating events in economic history. Before an envelope is opened, you don’t know what’s in it, and you aren’t committed to a course of action. So far as the contents of the envelope go, you’re an innocent. The contents may be true, false, incomplete, irrelevant, or stone-cold proof of wrongful intent. But whatever they are, they aren’t yet inside your head. They aren’t bothering you. They don’t affect your sleep, your self-perception, or your faith in the universe. But once the envelope is opened, the contents zap into your brain, where you have to deal with them. Yesterday afternoon I was enjoying a nice glass of wine at a Christmas party and having a conversation with a very informative fellow on a topic I never would have suspected would be of interest to me. Namely insurance. Hurm. Road not taken and all that. Still there was something intriguing in how much day-to-day activities need to be protected against potential risk. Furthermore, insurance covers everything from corporate espionage to fraud, from white-collar criminals to terrorists. Fascinating stuff. Then I picked up this book by Mr Colin Harrison and oo look, synchronicity kicks in once again. George Young is our hero, an insurance lawyer happily settled into a middle-class existence paid for by years working in the trenches of New York corporate law. He enjoys a loving relationship with his wife Carol, is a proud father to his daughter and likes going to Yankees games. He knows that in the greater scheme of things he was never especially successful, but in his time working for the firm Patton, Corbett & Strode he has earned a reputation for being a man who got the job down. He is also thankful for managing to survive the Global Financial Crisis relatively unscathed. It was Wilson Corbett who hired him for the firm and gave him the opportunity to make something of himself. Now his widow has requested that Young do one last favour for his former mentor. She is an old lady doubly haunted by the loss of her husband and the recent death of their son Roger, killed in a freak traffic accident moments after leaving a bar. She requests that Young find out what her troubled son was thinking about in the last few days of his death. Both the police and a private investigator named James Hicks have failed to give her any sense of resolution for the tragedy. So she has turned to Young, for isn’t he a man who can get results? What he discovers is a case far less simple than it first appears. It emerges that Roger, broken by divorce and his failure to live up to the business reputation of his father, may have been involved in something quite serious. There are hints of fraud, an unusual relationship with a Czech hand model and even Hicks tries to convince Young not to continue with the case. Even his wife questions the extent to which he is willing to pursue the last wishes of a dying woman. What exactly is he getting involved in? Folks I have a very simple system for reviewing these books. I have a collection of book-marks that I have amassed over the months. Every time I find a turn of phrase I enjoy, or an interesting passage, I insert one of the book-marks to spur on my review later. This afternoon I ran out of book-marks. Young is also a refreshingly self-aware investigator, anticipating the usual pitfalls of femme fatals and dangerous criminal plots without any of the insistent gullibility of some detective fiction protagonists. The story itself is tautly and intelligently told, with no John Grisham-esque fat on the bone. It is no surprise to discover that this book was originally published in serial form in the New York Times. This is smart and intriguing fare from a genre that insists on mystery, but often delivers formulaic plotting. Recommended.